History is written in broad brush-strokes, with the industrial revolution depicted as a battle between capital and workers. But as an early scene in MADE IN DAGENHAM shows, by the late 1960s - a period we can now see as the dying breath of the British union movement - both capital and workers had settled into cosy set-pieces and horse-trading with white men on either side. In this film those roles are played by Kenneth Cranham as the Union boss and Rupert Graves as the Ford boss. They are meeting to discuss equal pay for women, and both presume that the women's token representative, played by Sally Hawkins, should simply shut up and let the men decide what's what. That calcified system was ultimately dismantled by a woman - Margaret Thatcher - but she only got the political mandate to do so after the country had been brought to its knees in the mid-70s. This movie takes place earlier, but still gives us three women bucking the system. 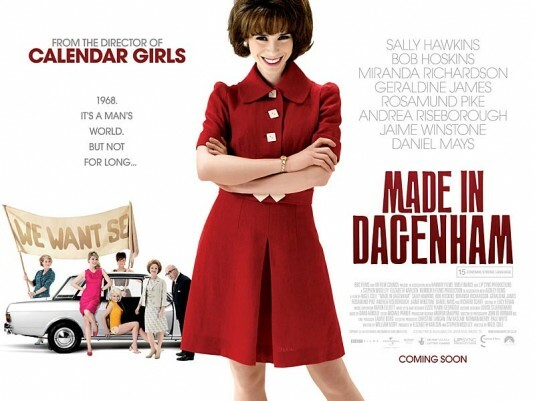 The first - our heroine - is Sally Hawkins' Rita - is a machinist working in Ford's Dagenham factory. She finds empathy from her boss's trophy wife/domestic slave, Lisa (Rosamund Pike) and support from Miranda Richardson's brilliantly spiky Barbara Castle. The film is a very easy watch, glorying in its period costumes and kitschy interiors, and rarely showing the true hardships of a strike. It's all rather day-glo and, worst of all words, "feel-good". Still, insofar as it does make you feel good while teaching you something about the fight for equal pay (a fight still not yet won), that can't really be a bad thing, can it? That said, one might have hoped for a movie painted in less broad strokes and with less of a simplistic moral stance. MADE IN DAGENHAM played Toronto 2010 and opened in Norway, the UK, Finland, Israel, the USA and Italy last year. It opened earlier this year in Germany, Austria, Switzerland, Spain, France, Portugal, Greece, Singapore, Kuwait, the Netherlands, Mexico, Denmark and Turkey. It is available to rent and own.